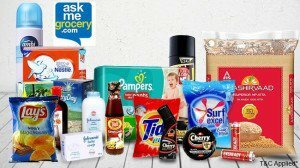 Askmegrocery.com is India’s fastest growing online grocery shopping portal that aims at fulfilling your daily grocery requirements and brings to you a gamut of products ranging from staples, dairy products, personal care products to other household utilities and thousands of brands & AskmeBazaar being one of the largest Online eCommerce Shopping Portal in India. Now get Flat 15% cashback on your orders via Mobikwik. Maximum MobiKwik cashback is Rs. 250. Offer is valid from 1st May till 4th May,2016. Valid once per user only. Get 15% cashback on AskmeBazaar & AskMeGrocery when you pay through MobiKwik. Maximum MobiKwik cashback is Rs. 250. Offer is valid from 1st May till 4th May,2016.